There are many options for contacting your student while he or she is at CIMBA, including phone calls, Skype, free texting apps, mail, and packages. To learn more about these options, please visit our pre-departure resource page. There you will find our recommendations for how to communicate with your loved one. We have many parents, family members, and friends who like to visit while a student is at CIMBA. Particularly for our longer program students, a little connection from home can feel great! When your student returns home with stars in his or her eyes, telling stories you will hear (over and over again! ), it will help put the experience in perspective. If you are planning a visit, here are a few things to consider. The Travel and Living Guide provided to our students will be extremely helpful as you plan your own international travel. If there is only one document you read, this is it! From our experience, it is best if families plan travel either during travel breaks, semester breaks, or after the CIMBA program ends. During the program – If you plan to visit during the semester, be sure to verify extended weekends, week-long travel breaks, or other breaks on the posted schedule for the semester. These are the only times we recommend visiting. Other weekends quickly fill up with student activities, travels, and academic classes. Truly free weekends outside of the travel breaks will not be verified or made available until after students are on campus. Do not make travel plans until after your student has arrived on campus and been provided with the official schedule. Please also note that we have a mandatory attendance policy and visits from a loved one whom has traveled across the globe to see them does not provide an excused absence. Academic requirements absolutely come first. After the program – Your student will be an experienced international traveler by this time and will likely be able to show you how to get around! If you are a U.S. citizen, you can be in the Schengen region without a visa for up to 90 days. Our CIMBA study abroad programs are currently under 90 days; therefore, no visa is required for U.S. citizens. We intentionally allow about one week at the end of our undergraduate semester programs for students to continue their travels in the Schengen region if they wish. If you would like to continue travels with your student after this week, we recommend traveling to other areas in Europe that are outside the Schengen region (such as England, Northern Ireland, Scotland, or Wales). France also has a special arrangement with the U.S. Government to allow an additional 90-day visit, if your other 90 days in the Schengen region have been outside of France. Non-U.S. citizens should check with the consulate of the countries you plan to visit to learn about restrictions. Paderno del Grappa is a quaint Italian village with a population of just over 2,000. There are no overnight guests allowed on campus, but there is a hotel just across the street from campus called Hotel San Giacomo as well as Da Romano Hotel very close to campus. Directions to campus are also found on the Maps & Directions page. Another popular option is to meet your student and begin your travels together from a mutually accessible location. It may be more convenient to allow the student to meet you in the city of your arriving flight and begin your travels together from there. We don’t recommend renting a car unless you are already an experienced European traveler. Public transportation is readily available and the added stress of driving in a foreign country, particularly if you don’t speak the language, can quickly reduce the ability to enjoy your travels to the fullest! You must be 24 years old to rent a car, and you must obtain an International Driving Permit in advance. Asolo is a nearby town, approximately 12 km from campus, also known as “The City of a Hundred Horizons” for its mountain views. The best way to get to Asolo from campus is by bus or taxi. With a population of less than 10,000 and architecture dating back to the 5th century, this is a destination not to miss! Formerly the home to the CIMBA MBA program, the fountain with a lion sculpture located here is part of the history incorporated into the CIMBA lion in our logo. While you are there, consider visiting Ristorante Pizzeria Cornaro Via Regina Cornaro, 214, 31011 Asolo, Italy. This is a family owned pizzeria run by Severio and Maria. 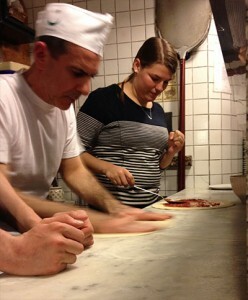 They frequently host CIMBA events for pizza-making lessons. They don’t speak English, but when they find out you are there with a CIMBA student, they will make you feel like family! Bassano del Grappa is approximately 16 km from campus. This area is best accessed by bus or taxi from campus. The town of over 40,000 is known for its covered bridge over the river Brenta, the grappa liqueur produced in the area, and the military history of Monte Grappa. Many of our students enjoy their open air markets on Wednesdays and Saturdays. Grab a sandwich at the local Tabacchi, which is a convenience store near campus. Our students say they make the best sandwiches ever! Bar Pasticceria Alpina Di Schiavon Fabio & Stefano S.N.C. located at Via 4 Novembre. Commonly called “Alpina,” it is the best place for a cup of coffee and fabulous fresh pastries.